“Once upon a time” springs to new life in present day in Rapunzel Variations, LEVYdance’s newest immersive production, premiering Feb. 14-17 at LEVYdance’s Heron Street studio. Rapunzel Variations, the company’s first work since 2017’s Pull Me Closer, is the creation of LEVYdance Executive Artistic Director Garance Marneur and Guest Choreographer Scotty Hardwig, in collaboration with LEVYdance Company and Guest Artists. Merging movement, song, live music, original compositions, and spoken word, Rapunzel Variations probes the fringes of society to ignite awareness of shared human experiences. Rapunzel Variations unearths common dreams and humanity within familiar archetypes – the Child, the Maiden, the Outcast, the Hero, the Villain – to recast these timeless characters within a contemporary narrative. “The show weaves together these traditional themes of innocence, desire, imprisonment, power, and sexuality into a 21st century context,” said Hardwig. In Variations, a restless Rapunzel confronts social alienation and the neurosis of a digital age. Rumpelstiltskin and the Miller's Daughter spotlight issues of class conflict and economic disparity, while the Witch, a freethinking outcast, craves connection and meaning in a chaotic world. “These complex themes take on a beautiful simplicity that will be both relevant and entertaining for a modern audience,” Hardwig said. 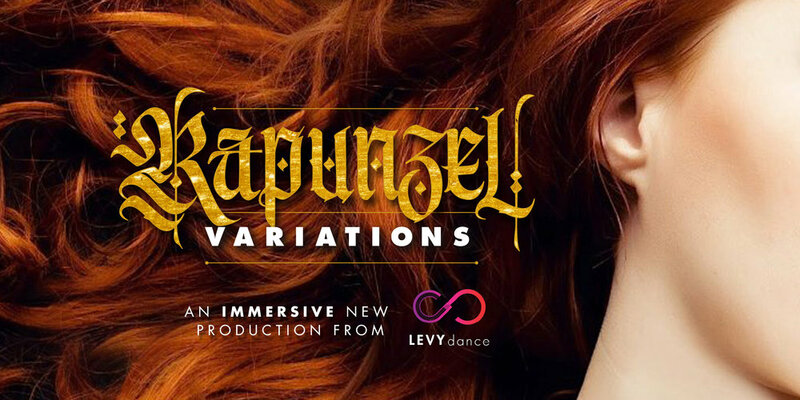 Created specifically for LEVYdance’s studio, Rapunzel Variations will transform the 3,000-square-foot space into an immersive labyrinth of fairytale lore. Journeying alongside performers, audiences will travel through fantastical environs – a life-size zoetrope, for example, gives way to a gold-encrusted cavern – and otherworldly scenarios, evoking the sense of magic and transformation so pivotal in fairytales. LEVYdance Company Artists Michaela Burns and Keanu Forrest Brady are joined by Guest Artists Cookie Harrist and Miche Wong. London-based composer Fred deFaye, Bay Area singer-songwriter David Wilcock and lyricist Trent Berry mastermind a driving soundscape for this otherworldly production, brought to life by LEVYdance Technical Director John Allbee and Lighting Designer Ian King, with sets and costumes by Garance Marneur.